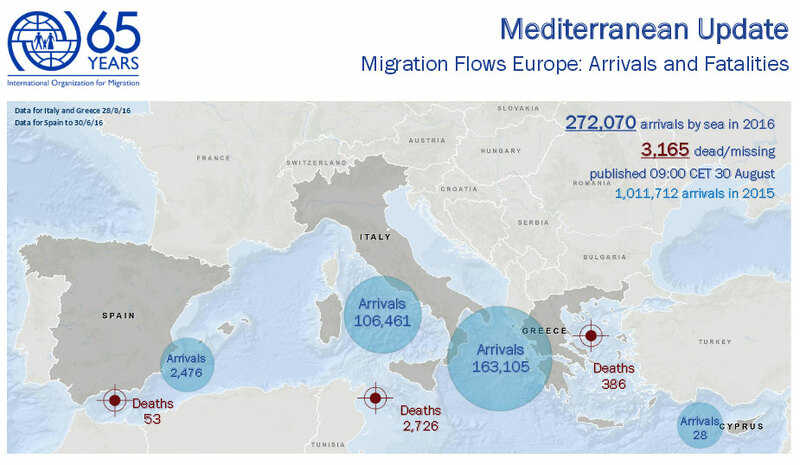 Switzerland - IOM reports that 272,070 migrants and refugees entered Europe by sea in 2016 through 28 August, arriving mostly in Greece and Italy, where 106,461 migrants and refugees have arrived during 2016. This total is lower than the number recorded through 2015’s first eight months, when a total of 354,618 arrivals were recorded crossing the Mediterranean, the majority from Turkey to Greece. Mediterranean fatalities among migrants and refugees stood at 3,165 through last weekend, or 509 more than IOM reported through 2015’s first eight months. IOM Rome reported on Monday some 1,119 migrants were rescued in the Channel of Sicily since IOM’s last report on August 26. Rome spokesperson Flavio Di Giacomo said that this number does not include the thousands who were reported rescued 13 miles north of the Libyan coastal town of Sabratha late Monday afternoon. - MSF ship “Dignity 1”. With these rescues IOM Rome estimates the total number of migrants rescued in 2016 is now around 111,500 on the Central Mediterranean route. Many of those rescued were sailing in a flotilla of an estimated 44 rubber dinghies, eight small wooden boats and two bigger wooden fishing boats. It is not known if there were any further casualties among the passengers, although photographs of the rescue did show survivors swimming in the sea, including some wearing life jackets. Di Giacomo noted that while rescues have been robust during August, casualties on the Central Mediterranean route have been light this past month – just 40 through the current week compared with over 600 dead in both Augusts of the previous two years. He said that sea conditions – abnormally windy – may have kept some boats from leaving North Africa. IOM Athens reported Monday that migrant and refugee arrivals in Greece in August were 2,808 through 28 August – the largest monthly number since April.